After several miles, and so many twists and turns that I'm not sure which way is which, I climb to the top of a high ridge, and everything changes. A picture of the place is added to how it sounds. The countryside opens up. Clouds burn away. Sunshine warms the ridge. Mount McLoughlin stares huge and white, just across the valley. I look around. I know this place. It has a name: Deer Creek. I was here years before. 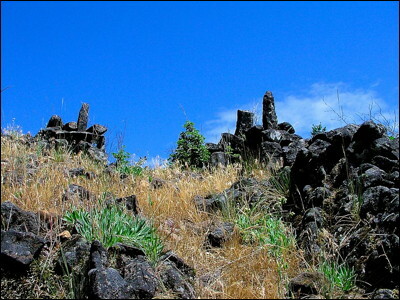 It is one of the Takelma solstice sites: five cairns built from columnar basalt cover the knoll on the edge of the ridge. They line up with the sun rising over Mount McLoughlin on the morning of the winter solstice. Tomorrow. I wait for this place to tell me more about where I am. If I am still enough, perhaps a story will settle into my dreams. I kindle a small fire and wrap a blanket around me. I watch the sun shatter into sunset. I watch sparks spiral into a sky that slowly fills with stars.